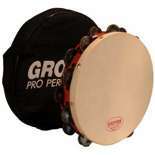 The Grover Pro Percussion T2/HTS 10" Double Row Tambourine features Heat-Treated Silver tambourine jingles, double mounted premium white skin head, captive pin system, staggered jingle slot configuration, solid hardwood shell, and reduced width grip. A free tambourine bag is also included. The Grover Pro Heat-Treated Silver tambourine resounds with a superb combination of bright, extra dry, and full sonorities. Percussionists who desire an articulate, "crunchy" spread of overtones will appreciate the extra steps Grover takes that crystallize the molecular structure of their German Silver alloy. The T2/HTS Tambourine is perfect for passages that require exaggerated articulation. I recently assisted in presenting a seminar on the quality of sound in the concert percussion and performed a tambourine duet using this Grover and my co-presenter using an equivalent Black Swamp. I found that this tambourine is lighter making for easier and cleaner shake rolls and the jingles have the perfect make for thumb rolls at any dynamic level. The head on the Grover has a preferable quality as well that is superior to the synthetic Black Swamp. I would choose this tambourine over anything hands down. I recently purchased one of these great instruments and I am amazed. The overall sound quality and quality of the tambourine itself is incredible. 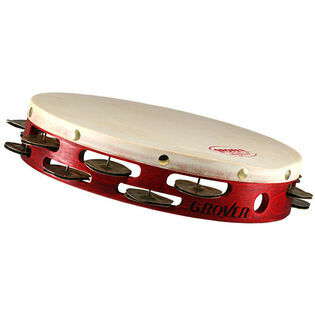 The crimped jingles produce a very impressive sound that sounds different every time you play it. The value is great and is a great buy. I highly recommend it to anyone for their next purchase.